Allow RBTH to guide you on a scavenger hunt of Russian haunts in the nation’s capital. Cultural centers, churches, borscht joints, and diplomatic hot spots – the trail of Russian sights to see in D.C. is almost as long as the history between America and Russia. The Russian footprint in D.C. may not be as prominent as in New York City, but the nation’s capital has its share of significant must-see locations for any Russophile. Despite a low population of Russians living in D.C. proper, diplomatic exchanges and a plethora of Russian studies programs at D.C.-based universities ensure that many places in Washington cater to those with a Russian bent. 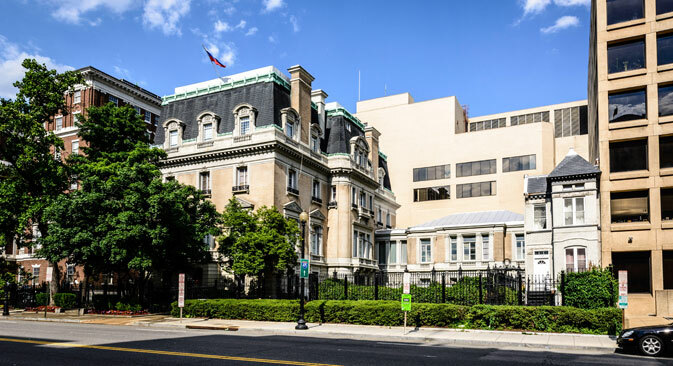 The capital is home to the Russian Embassy, as well as the former embassy of the Soviet Union, which is now the residence of Russian Ambassador Sergey Kislyak. Built in 1912 at 1125th 16th Street, N.W., for the widow of famous American entrepreneur George Pullman, this three-story mansion was the most expensive in Washington, at $360,000. Incidentally, Mrs. Pullman never actually lived there. Russian Emperor Nicholas II bought the building in 1913 for $350,000. In the hundred years of its existence, the mansion on 16th Street has served the Russian Empire, the USSR, and the Russian Federation. In 1994, Russia’s diplomatic mission officially moved to 2650 Wisconsin Ave, N.W. Near the Russian Embassy stands the St. Nicholas Cathedral (3500 Massachusetts Ave, N.W. ), the cathedral of the Orthodox Church in America. Sunday and religious holiday services take place in three languages: Church Slavonic, English and Georgian. On some weekends, a market goes up next to the church, offering samplings of Russian, Ukrainian and Georgian foods. Another of Washington’s prominent Orthodox churches is the Cathedral of St. John the Baptist (4001 17th Street, N.W.). Built in the Moscow-Yaroslavl style, the red brick churche is decorated with bright tiles and colorful frescos, rare for Russian churches abroad. It is part of the Russian Orthodox Church Abroad (ROCOR). The cathedral boasts a library with a large collection of books from members of the Russian nobility that fled the Bolsheviks after the 1917 Revolution. Some of their descendants still attend services there today. The Russian Cultural Center, the official home of Russian culture in the U.S., is located at 1825 Phelps Place N.W. Founded 15 years ago as part of a bilateral agreement between Russia and the U.S., the center resides in a cozy, three-story, 19th century mansion whose early occupants owned the Hope Diamond and the Washington Post. The Russian Cultural Center regularly organizes exhibitions of Russian and American artists. Two clubs function within the Center: the scientific group and the discussion group. The center also offers Russian language courses and conducts seminars dedicated to Russian linguistics. The center frequently organizes events that attract large audiences of Americans who admire Russian art, according to Zhiganov. Next year’s main event: a series of celebrations honoring the 70th anniversary of the World War II victory. In May 2014, after a 10-month construction period, the John F. Kennedy Center for the Performing Arts at 2700 F Street N.W. opened the Russian Lounge at the Opera House. Designed to emphasize Russia’s cultural contributions beyond nesting dolls and dancing bears, the sleek lounge is available to visit on organized tours. For Russian culture seekers who love music, the Russian chamber music ensemble, headed by Vera Danchenko-Stern, has been playing Russian romances in the U.S. for nine years. On Dec. 5, the ensemble will perform a concert dedicated entirely to the music of Peter Tchaikovsky at the Austrian Embassy. Another point of Russian interest in Washington is American University, which specializes in the conservation and development of Russian culture in the United States. The university’s history department created the Initiative for Russian Culture, which organizes Russian art exhibitions, seminars and roundtables in Washington. In 2012, the initiative supported the creation of the Leo Tolstoy monument, which was placed in the university gardens at 4400 Massachusetts Ave N.W. To encounter another famous author, widely considered the father of all Russian poetry and literature, Russian literary enthusiasts can find on the corner of 22nd Street and H Street N.W. a bronze Alexander Pushkin. Crafted by sculptor Alexander Bourganov, the Russian bard stands on the campus of the George Washington University, erected in 2000 as a literary exchange with Moscow. In turn, Moscow later received a statue of the American poet, Walt Whitman. After exploring the historical, religious and cultural Russian “dostopremachatel’nosti,” a long word that means ‘sights worth seeing,’ Russian foodies have three main choices of restaurants. Russia House (1800 Connecticut Ave., N.W.) claims to have the largest collection of vodkas in the U.S. Rus-Uz (1000 N. Randolph St. Arlington, Virginia) promotes a unique blend of Russian and Uzbek cuisines, and also caters. However, Washington’s most famous Russian restaurant, Mari Vanna (1141 Connecticut Ave N.W. ), is certainly the place to end your tour of Russian offerings. This eclectic eatery provides visitors not only a wide array of national dishes, but also an enjoyable if unusual Russian atmosphere.To get a sense of the inside, imagine if your Russian grandmother hired a team of hipster decoratorswho previously worked at Anthropologie. In October, the restaurant added Ukrainian and Uzbek dishes to the menu and enlarged the choice of vegetarian options. On top of that, famous Russian habitués such as Mikhail Khodorkovsky and Washington Capitols’ star, Alexander Ovechkin, sometimes visit at the restaurant. Ovechkin celebrated his birthday there in September. If you cannot go to Russia (or Brighton Beach), but want to experience Russian life, Washington has plenty to offer those who are newly interested in Russian culture as well as provide comfort to those who miss the art, food, and atmosphere of that vast, beautiful country.